A Comparative study of Blood Pressure, Heart Rate Variability and Metabolic risk factors in Software professionals. Aswini Dutt R, Satish Kumar NS, Ramaswamy C, Ramesh Bhat M, Niranjan Murthy HL. There has been an alarming emergence of Hypertension worldwide. Its increasing prevalence in young generation is a significant factor for the development of autonomic and metabolic disorders. Major causes of hypertensive pattern are increasing work stress, strict deadlines and high expectations among corporate population. High blood pressure can lead to autonomic imbalance and can alter metabolic parameters. The present study was undertaken to compare the arterial blood pressure (BP), Heart Rate Variability (HRV) and Random Blood Sugar (RBS) levels in software professionals. Seventy four male software professionals of Infosys software company, Mangalore, Karnataka, India in the age group of 21â€“45 years were divided into two groups based on their BP recordings. 21 were normotensives and 53 hypertensives. Anthropometric measurements were taken. Their BP was recorded in supine position. Deep breathing HRV test was conducted. Random blood glucose levels were determined by Glucose oxidase method. HRV and RBS levels were compared statistically between the two groups. Unpaired t test was used to test the significance and all tests were two-tailed and p< 0.05 is considered as significant. Hypertensives had significantly lesser HRV(p=0.028), greater Random Blood glucose (p =0.0009) compared to normotensives. Hypertensive Software professionls have lower Heart rate variability and increased blood glucose levels. Blood pressure is inversely proportional to Heart Rate Variability. Hypothalamo-adrenal activity mediated increased sympathetic drive in hypertension increases the glucose levels. Key words: Keywords: Hypertension, Heart rate variability, Blood glucose, Software professional. Aswini Dutt R, Satish Kumar NS, Ramaswamy C, Ramesh Bhat M, Niranjan Murthy HL. A Comparative study of Blood Pressure, Heart Rate Variability and Metabolic risk factors in Software professionals.. Natl J Physiol Pharm Pharmacol. 2011; 1(2): 51-56. Aswini Dutt R, Satish Kumar NS, Ramaswamy C, Ramesh Bhat M, Niranjan Murthy HL. A Comparative study of Blood Pressure, Heart Rate Variability and Metabolic risk factors in Software professionals.. http://www.njppp.com/?mno=7192 [Access: April 25, 2019]. Aswini Dutt R, Satish Kumar NS, Ramaswamy C, Ramesh Bhat M, Niranjan Murthy HL. A Comparative study of Blood Pressure, Heart Rate Variability and Metabolic risk factors in Software professionals.. Natl J Physiol Pharm Pharmacol. (2011), [cited April 25, 2019]; 1(2): 51-56. 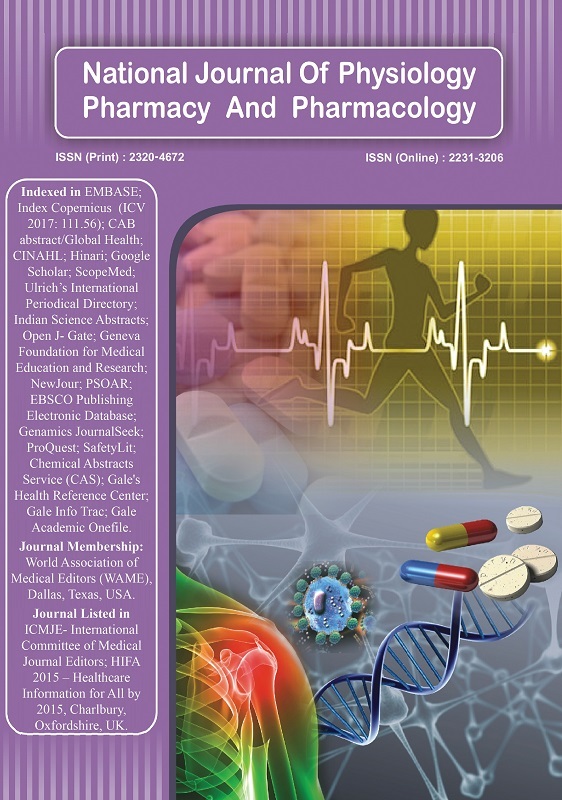 Aswini Dutt R, Satish Kumar NS, Ramaswamy C, Ramesh Bhat M, Niranjan Murthy HL (2011) A Comparative study of Blood Pressure, Heart Rate Variability and Metabolic risk factors in Software professionals.. Natl J Physiol Pharm Pharmacol, 1 (2), 51-56. Aswini Dutt R, Satish Kumar NS, Ramaswamy C, Ramesh Bhat M, Niranjan Murthy HL. 2011. A Comparative study of Blood Pressure, Heart Rate Variability and Metabolic risk factors in Software professionals.. National Journal of Physiology, Pharmacy and Pharmacology, 1 (2), 51-56. Aswini Dutt R, Satish Kumar NS, Ramaswamy C, Ramesh Bhat M, Niranjan Murthy HL. "A Comparative study of Blood Pressure, Heart Rate Variability and Metabolic risk factors in Software professionals.." National Journal of Physiology, Pharmacy and Pharmacology 1 (2011), 51-56. Aswini Dutt R, Satish Kumar NS, Ramaswamy C, Ramesh Bhat M, Niranjan Murthy HL. "A Comparative study of Blood Pressure, Heart Rate Variability and Metabolic risk factors in Software professionals.." National Journal of Physiology, Pharmacy and Pharmacology 1.2 (2011), 51-56. Print. Aswini Dutt R, Satish Kumar NS, Ramaswamy C, Ramesh Bhat M, Niranjan Murthy HL (2011) A Comparative study of Blood Pressure, Heart Rate Variability and Metabolic risk factors in Software professionals.. National Journal of Physiology, Pharmacy and Pharmacology, 1 (2), 51-56.